Convicted 24.10.1916 of allowing consumption out of hours. Fine 10/- or 7 days. The King Street entrance February 1972. House had entrances from Crown Road and King Street. On the morning of Monday 18th July 1859 the duty constable found the house open for the sale of beer at 4 o'clock. The constable had warned licensee Moore some two hours previously. At the Magistrates Court Tuesday 19th July, the chief constable said the worst part of the offence was that accused offered to treat the officer, in order that the transgression be overlooked. Since Moore pleaded guilty and due to the fact that no complaint had ever been made against the house before, the fine of only 1 shilling plus costs was applied. Known as STUDIO 4 from c1960. 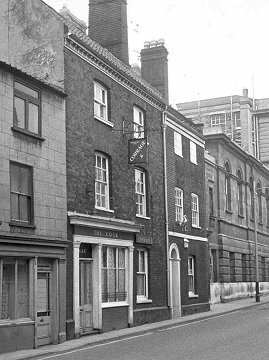 The Upper King Street bar closed c1975.